Smith 8-1/2 in. 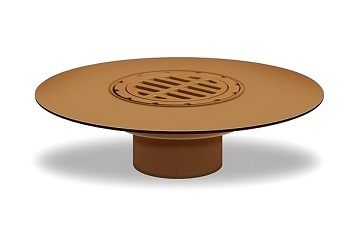 Cast Iron Deck Drain Kit, 4 in. AVAILABLE OPTIONS: Membrane clamp (R), Underdeck Clamp (C), No-hub adaptor (Y), Polished Bronze Top (PB), Nickel Bronze Top (NB), Securing Holes (SH), Threaded outlet (DX1240T), Caulk Outlet (DX1240C).